Bond (School Building Improvement Bond) / Sellwood M.S. 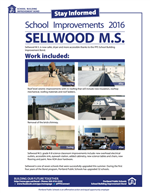 As part of the School Building Improvement Bond, Sellwood M.S. 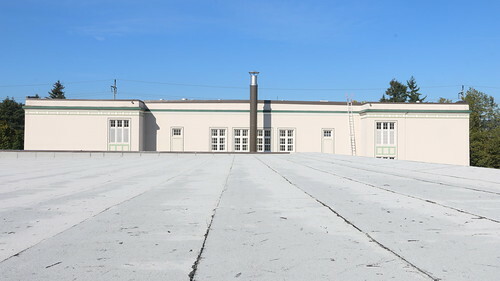 received in the summer of 2016 a new seismically strengthened roof science classroom improvements and ADA improvements. Click here to view a photo album of the completed Sellwood Bond work. Roof level seismic improvements with re-roofing that will include new insulation, rooftop mechanical, roofing materials and roof ladders. Sellwood M.S. grade K-8 science classroom improvements include: new overhead electrical outlets, accessible sink, eyewash station, added cabinetry, new science tables and chairs, new flooring and paint. Construction began immediately following the end of school in June 2016 and was completed before school began in late August. The work is scheduled during the summer to minimize the impact on schools and students. Please view the flyers below to learn more about the work done at Sellwood M.S. in the summer of 2016.